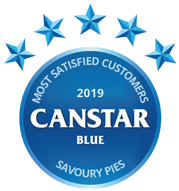 Compare Savoury Pies in New Zealand at Canstar Blue. Jesters, Big Ben, Coupland’s Bakeries, Dad’s Pies, I Love Pies, Irvines, Jimmy’s Pies, Maketu Pies, Mrs Mac’s Pies, New World Pies, Pams, Ponsonby Pies and Westie were compared on taste, texture/consistency, value for money, variety/range, packaging and overall satisfaction. Canstar Blue research finalised in February 2019, published in April 2019. Jesters rated number one for customer satisfaction. Savoury pies may just be one of the most flavoursome delicacies New Zealand has to offer. Just imagine, steak and cheese encased in a buttery pastry and doused in gravy, accompanied by a side of creamy mash and peas, or chips – crispy on the outside, fluffy on the inside. My mouth waters just thinking about it. The pie can be very versatile. Pick one up from the supermarket on the way home and dinner’s set. Dress it up, dress it down, she’s good to go. And, as society starts to progress, people are seeking the new – the innovative. Flavours are starting to become even more unique. Just look at Jester’s seasonal special – chicken and avocado burger-flavoured pie. It shows that anything goes. However, of those of us that eat the delicious delicacy, I’m sure we’ve all been disappointed at some stage, by the choice of brand and flavour. Consequently, ‘damn, I should’ve gone with the usual’ has passed through our mind. So, we spoke to 1272 Kiwis who have purchased and eaten a packaged savoury pie from a supermarket in the last 6 months. Respondents rated these pies on taste, texture/consistency, value for money, variety/range, packaging and overall satisfaction. Jesters weren’t flaking when it comes to customer satisfaction, as they scooped up 5-stars for every single factor except value for money, where they received 4-stars. Runner up was Maketu Pies who scored 4-stars across the board. Third place goes to Jimmy’s Pies who was recognised for the taste of their pies, earning 5-stars in this section, while they were given 4-stars for the remaining sections. The only other 5-stars given out were to Ponsonby’s Pies and Coupland’s Bakeries, for the value for money factor in both cases. The most common statement Kiwis agreed within our survey was that they think pies are a part of Kiwi culture, with a substantial 72% of respondents agreeing with the statement. Due to the New Zealand pie culture, it’s apparent the market isn’t limited for choice when it comes to available brands. But with our survey results, you can rest assured the top picks to test out. Below we’ve listed the 5 highest rated pie companies so you can have your slice of pie, and eat it too. Canstar Blue’s research shows Kiwi’s love a classic flavoured pie, with 23% of people choosing the mince and cheese as their favourite and a further 23% people choosing the steak and cheese flavour. All pie brands below venture further from the classic, though, so let’s dive in and see what they have to offer! Opening its doors in 2002 as a single store in Lynn Mall, the successful Jester’s Pies has since expanded its reach nationwide and even stock their pies at more than 40 Caltex stations. 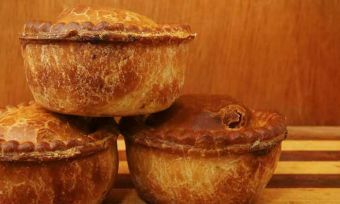 The range and creativity Jester’s Pies has is impressive, with everything from the stock-standard mince and cheese to Southern fried chicken, cheese gravy and BBQ sauce within the actual pie. Jester’s Pies are diet-friendly, offering vegan, meat-free and gluten-free pies while also doing catering. And, Kiwis must love the taste as Jester’s Pies were recognised as 5-stars for their taste in our survey. Coming in at second place for overall satisfaction in our survey, Maketu Pies have more of a classic range with all the popular and common flavours, from potato top to butter chicken. However, Maketu Pies also offers a ‘Fancy Pies’ range which includes prime beef and blue cheese and chicken, leek and tarragon, amongst other flavours. They also stock family-size pies, perfect for those evenings where you just don’t have the energy to do an elaborate dish for the fam. You can find Maketu pies in Countdown, PAK’Nsave, New World, Four Square, SuperValue and FreshChoice. Jimmy’s Pies were the only other pie to receive 5-stars for taste, in our survey. Jimmy’s Pies are a South Island favourite which were established over 50 years ago and now stock 20 flavours throughout the South Island. World famous travel guide book publisher – Lonely Planet – even mentioned Jimmy’s Pies in their top Central Otago restaurants, top things to do in Roxburgh and top things to do in Central Otago. Dad’s Pies ranks fourth in our nationwide survey, scoring 4-stars across all factors except value for money and variety/range where they were given 3-stars. 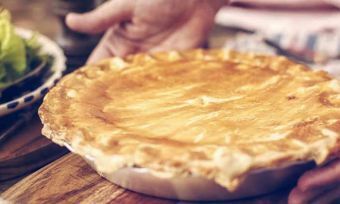 Dad’s Pie’s humble beginning was in the Hibiscus Coast suburb – Red Beach – where a Dutch couple started serving pies to beach-goers, in a small store, only 6 months after moving here. Dad’s Pies became a success and they now stock nationwide and internationally, loved by Kiwis and beyond. Their mission is “the pursuit of pure pie-fection” and from our results, Kiwis would agree. Ponsonby Pies were rated 4-stars for overall satisfaction and all other factors except value for money, in which they gained 3-stars. Ponsonby Pies is the gourmet one of the bunch, and first began making pies in 1978. They are now owned by Gourmet Foods Limited who also own popular pie brand – Pat’s Pantry, so you can tell Ponsonby Pies know how to work the pie market. Ponsonby Pies stand by the belief of a “real meat” pie and therefore use New Zealand Prime Hereford beef without any meat fillers such as soy proteins. The chicken and kumara Ponsonby Pie is one flavour we haven’t seen elsewhere! Canstar Blue surveyed 2,500 New Zealand consumers across a range of categories to measure and track customer satisfaction, via ISO 26362 accredited research panels managed by Qualtrics. The outcomes reported are the results from customers who have purchased and eaten a packaged savoury pie from a supermarket in the last 6 months. In this case, 1272 New Zealanders.